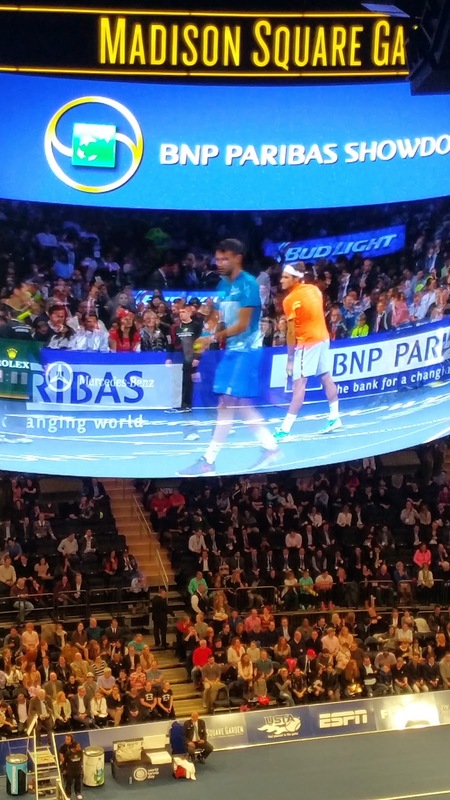 Last night 14,894 Feder-I mean-tennis fans piled into Madison Square Garden for the 8th annual BNP Paribas Showdown. The exhibition event, the centerpiece of World Tennis Day, starred Hall of Famers Gabriela Sabatini and Monica Seles, alongside 17-time major champion Roger Federer and Grigor Dimitrov. Given the bracing cold of this New York winter, the sight of tennis, with its perpetually tanned competitors, doing (something approximating) battle in midtown Manhattan was as sure a sign of the spring thaw underway as the sudden vanishing of our street corner slush ponds. So how did this Showdown fare as an exhibition event? Let’s go to the checklist. · Witty banter between opponents? Check. · Circus shots, including a tweener or two? Check. · Cute kid “randomly” plucked from the audience? Check. · That kid being a ringer who knows how to wield a racquet well enough to take softballs from the pros? Check. · Some spellbinding tennis that almost makes you forget that these aren’t fully competitive matches. Check. All in all, the event succeeded. The proceedings kicked off with Seles and Sabatini commemorating the 25th anniversary of their 5-set (yes, you read that correctly, 5-set) final at the WTA Championships, which were previously held in Madison Square Garden. The match would be much shorter yesterday, an 8-game pro set in which Seles appeared to often be tentative. The famously two-handed ball striker often resorted to one-handed gets and her famous/infamous “aah-eeh” grunt took a while to get fully fired up, but still it was a joy to see Seles on court, for one of her very few exhibitions since leaving the game due to injury in 2003. The Argentine (who looks as if she hasn’t aged a day since she left the tour) shocked the crowd, not so much by winning the friendly tussle 8-5, but by revealing to on-court interviewer Patrick McEnroe that before prepping for the Showdown she hadn’t hit a tennis ball since 2009. 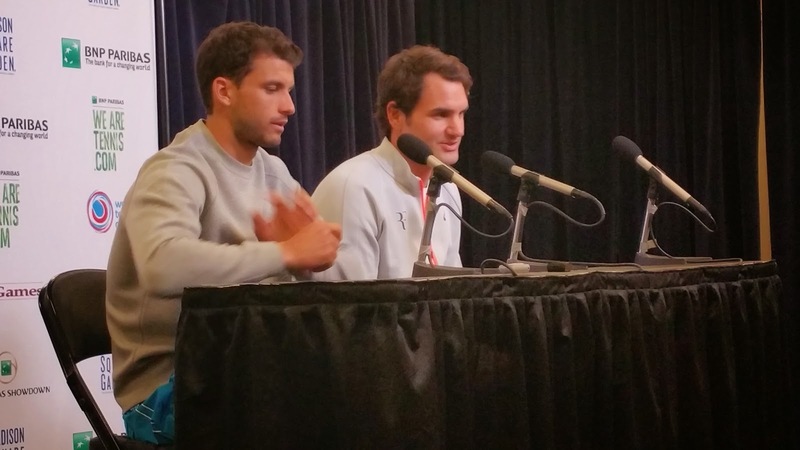 It was clear though from the late-arriving crowd and the general energy level in the building that the star attractions were Federer and Dimitrov, the latter of whom was playing the World’s Most Famous Arena for the first time. The arrival of the ATP legend and his presumptive understudy, famously nicknamed “Baby Fed,” kicked the decibel level up by more than a few notches. Dimitrov, though an affable presence throughout, wasted little time with pleasantries once play commenced. After quick, brilliant opening service holds from both guys, Dimitrov broke at love on his next opportunity, surging into a first set lead that he wouldn’t give back en route to winning the opening stanza 6-2 in just 22 minutes. The assembled audience began to murmur and at times vociferously cheer for Federer and the Swiss superstar had no intention of disappointing his assembled faithful. A point that featured back-to-back tweeners from Dimitrov and Federer, before Dimitrov sailed a reply long highlighted the second set, which Federer would win in a blitzkrieg, 6-1. The fun, spirited match would go to a deciding third set where Dimitrov would take a circus point of his own. Federer smacked an errant shot that sailed up near the jumbotron that hovered above the court, the ball came down quickly and landed smack in between Dimitrov’s legs. Dimitrov bounced backward to avoid touching the ball and after a couple rally shots took the point en route to winning the third set and the match 6-2, 1-6, 7-5. There’s a necessary distance between the slush ponds of early March and the sweat pools of late August, but the thaw always starts somewhere. The BNP Paribas Showdown kicked off the journey into the heart of the tennis calendar (defined roughly as the period between Indian Wells and the US Open) last night in style. Cartier incarnates the particular esteem and also elitism. replica dior resemble the original Cartier timepieces. As opposed to the particular Cartier artificial timepieces the particular dior outlet are manufactured in how to be able to sustain the particular traditional layout as well as the away from frequent top quality. Any cheap dior replica won't help make any person consider an affordable replicate being a artificial timepieces obtained inside our retailer can be a replicated with the authentic merchandise getting totally in keeping with the particular last option. Nonetheless any look-alike Cartier just isn't very costly in order to manage getting fake louis vuitton bags to suit your needs then one to your good friend! ensure it is any fantasy regarding frequent visitors to feel the high end with the artist timepieces. The worth regarding replica christian dior isn't only moment used on handbook typing, but in addition atlanta divorce attorneys second depth.